Axiom: Rhythm is one of the fundamental elements of music. Some might even consider it the fundamental element. Although usually involved in both melody and harmony, many times rhythm functions by itself. If nothing else, it informs us when to step, swing, march, move our hips or tap our feet. In a previous series of posts I examined triple meter and the ways in which composers created that unique meter, one that divides a beat into three parts. I will be starting a new series that moves away from orchestration as the prime focus and examines some interesting examples that take standard rhythms and play with them, throwing our rhythmic equilibrium off just a bit—sometimes more than just a bit. Most of the examples will be taken from twentieth century works and a few are from the popular music world. 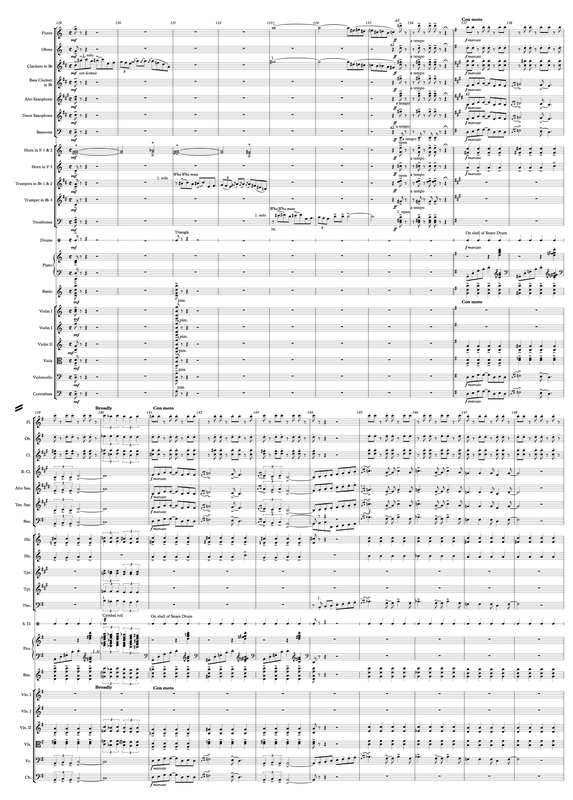 But for you die-hard orchestrators, there’ll still be scores to examine. As I was exploring music for this upcoming series, I came across a wide variety of styles and arrangements of George Gershwin’s Rhapsody in Blue. A week or two ago was the composer’s birthday. As a nod to one of the most beloved American composers, I’ve chosen to examine one passage in the work for this post and to show the wide range of different interpretations of it. The example itself will serve as a perfect introduction to the upcoming series on rhythmic dynamics. A good place to start is a recording with Howard Hanson on the podium and Eugene List at the piano. You can hear the passage in Example 58.1. Before examining the recording, it’s a good idea to get a handle on the compositional and the orchestrational elements that are present therein. The bluesy opening two measure clarinet pattern is followed by two variations, first with the trumpet and then with the trombone. Both brass instruments are playing into Wah-Wah mutes. (In the score these are called Wha-Wha mutes.) At the end of the 8 measure phrase there is a tutti set of punctuations leading to the key change from C to G.
For those of you who are not familiar with the interesting array of mutes any self-respecting trumpet or trombone player will carry around, the Wah-Wah mute is generally similar to a straight mute (conical in shape), but with the addition of a cup-shaped base. Once inserted into the bell, all of the air is forced into the mute and the bottom can be manipulated while playing. It gives a nasal quality to the sound. What makes the Wah-Wah mute distinctive is that the bottom of the cone, the cup, can be moved by the performer while playing to change the sound quality. You can hear a variety of approaches players have taken throughout the examples in this article. The next section, beginning at measure 137, presents one of the main thematic ideas (of the half-dozen or so motifs) in the work. You can see this in a section of the cello part in Image 58.1. Behind this memorable tune is the fundamental, straight forward, 4 beats to the bar rhythmic harmony. This is played by the horns, strings, and, oh yes, the tenor banjo. It’s a holdover from Paul Whiteman’s Jazz Orchestra and made its way into the 1942 published score of the work. However, in my survey of recordings I was hard pressed to find one that featured tenor banjo – or tuba, for that matter. Nevertheless, I’ve included it in the visual score to Rhapsody in Blue. Here is a still image from the 1945 Hollywood version of Gershwin’s eponymous biopic. You can see the banjo player right in the middle of the photo in Image 58.2. There is actually one example in this post that includes the banjo in the performance. Note that when the score gets to the quarter note triplets in measure 140, except for the melody sustaining the C, everyone plays the triplets. The lack of the steady four beats in that measure only serves to emphasize the triplet rhythm, taking a break from the steady 4/4 beat. Even the percussion stops its drumming on the snare drum shell and generally provides a cymbal roll as indicated. Although it’s written for the piano to play an eighth note arpeggio on the first half of the measure ending with a quarter note accent on beat four, it’s difficult to hear most of the piano part. Now for one of the key reasons I’ve introduced this passage: Listen to Example 58.2. It’s just a MIDI recording, but it gives a hint of the detail the composer and orchestrator included to keep the theme (Image 58.1) fresh. This shows what the upper woodwinds are playing here opposite the melody and the 4/4 rhythmic accompaniment. This type of juxtaposition of one standard rhythmic pattern against one that belies another is a way to keep an audience entertained and involved. As you listen, remember that there are four quarter notes in each bar, not even hinted at by this pattern of chords in three eighth note groupings (two eighth notes and an eighth rest). Now that you are aware of these three basic parts of this passage, I suggest going back to Example 58.1 and listening to the orchestra. Hear the way the conductor, the orchestra, the recording engineer and the producer mix the elements that have been cited. Continue reading to hearing quite a few variations of it. In 1925, Gershwin recorded the solo piano part onto a then-current digital recording device known as a piano roll. For those of you unaware of this device, it’s for capturing a pianist’s performance of a work. Holes are punched into a long roll of paper as the performer plays on a specially equipped piano. The roll can then be used to reproduce the performance on other piano roll equipped instruments. In the 1970s, Michael Tilson Thomas recorded the Rhapsody with the piano roll acting as soloist accompanied by The Columbia Jazz Band. It’s been argued that this piano roll version is “way too fast” and its tempos are considerably faster than the other recordings I’ve found. However, the recording might prove to be closer to the original tempos envisioned by Gershwin and Ferde Grofé, the work’s original orchestrator. Listen to Example 58.3. This version you’ll notice—after you get over the shock of the dramatically fast pace—leaves little room for the rubato style in the solo winds. One item that is easy to hear is the difference in the style in the descending eighth notes between measures 134 and 135 in the flute and clarinet. It’s as though the one long slur has been rewritten as two-eighth note groups with the tension on the first note and the release on the second. You can also hear how the quarter note triplets in measure 140, because of this blazingly fast pace, are almost lilting in 1. In addition, there is a quick ascending trumpet “pyramid” behind the upward eighth note lines in measure 144, not in the 1942 score. Regardless, the three-against-four eighth note pattern from Example 58.2 is easily discernible and notably present as a more “forward” force in the passage and not just a background element that appears to be the case in many other recordings. There are many versions of the Rhapsody, even more than a few called “The Original.” One of the most commonly performed of the definitive published versions is the one done by Ferde Grofé, one of Paul Whiteman’s orchestrators. Because of the short time Gershwin had to write the work and possibly his own feelings about his lack of mastery of orchestration at the time, Whiteman asked Grofé to create the first orchestration for the 1924 premiere from Gershwin’s two piano score. He later fleshed the original out and it was published in 1942. When listening to this example, you can hear the dramatic differences between the alto saxophone and the tenor saxophone, the latter playing in a more comfortable and more easily controlled part of its range. A handful of French composers, among others, tried out the saxophone as a solo instrument in the latter half of the nineteenth century, but the repertoire is slender, especially compared to that of the piano, violin, and clarinet. Earl Wild recorded Rhapsody in Blue several times with different conductors. Here’s an example from quite a few years later, conducted by Arthur Fiedler and played by the Boston Pops. The first thing you’ll note in Example 58.5 is how Fiedler almost takes the wind solos at a constant rhythm. Yes, there is a bit of rubato, but nothing as dramatic as in the Toscanini or the Hanson recordings. One new “feature” in this brief survey that you’ll hear in this and many recordings of the work is the staccato cymbal on the last beat of measure 136. This recording also makes the piano part beginning in measure 137 heard quite clearly. And, while certainly not a major addition to the solo piano presentation, the accents on the final beats of measures 137-139 and 141-143 contribute to the jazzy rhythmic impetus of the section, highlighting the 4 to 1 feeling. This recording obscures the problems of the low saxophone notes by boosting the low string lines. It is also cleaner than some of the earlier Toscanini recording in the upper woodwind passage, especially when you get to measure 145. This next example is another recording by Michael Tilson Thomas who is now playing the piano and conducting. While he takes the passage at a faster pace than any of the other examples presented here, it’s not nearly at the breakneck speed of the piano roll in Example 58.3 above. One of the first items you’ll notice is the first two solo winds (clarinet, then trumpet) playing their two measure solos almost in tempo. It’s not until the trombone enters that the passage contains a bit of rubato. As in the Fiedler, the previous recording, this recording also includes the staccato cymbal crash on the fourth beat of measure 136. The saxophones blend in with the rest of those playing the melody. What’s quite different here is the way the upper woodwind staccato notes are difficult to perceive. It takes some careful listening to even notice that part. (When you do you might even hear staccato violins playing it instead of the upper winds. It’s difficult to be sure.) Speaking of which, if you listen carefully you can hear that the orchestra includes the tenor banjo in the recording. As I mentioned above, this is rarely done. There is also a change to the percussion line. Although the Grofé score instructs the percussion to play a cymbal roll on the two quarter note triplets throughout measure 140, in this recording the roll is simply on the snare drum. The trumpet “pyramid” similar to the earlier piano roll version, is included here, but it’s played in a marcato fashion. One other tidbit in this recording is on the downbeat of measure 133. You can just barely hear an eighth note chord played by the two horns on the downbeat. It accents just slightly the transition from the sustained horn chord to the sustained upper woodwind one. It’s one thing to manipulate the score by changing the phrasing (modifying slurs or letting a performer be flexible with a rubato solo), adding a punctuation (like a cymbal crash), or, as you’ve heard, omitting a triangle note. It’s something else to add a new solo piano part. Example 58.7 presents a pianist who decides that this brief passage needs exactly that. If you avoid focusing on the soloist’s “enhancements” you hear many of the stylistic interpretations that the previous example’s have provided. Here are those, in summary: The three wind performers take advantage of their solos to freely interpret the rubato. This performance also adds the staccato cymbal crash on the fourth beat of the measure (136) right before the key change. The upper woodwind eighth note figures are an essential element of the passage when they enter in measure 137 and not pushed to the background as in some of the other recordings. The saxophones are featured and blend well with the others on that melody line. The percussion does a cymbal roll and not a snare drum roll behind the triplets in measure 140. What’s added are flourishes the pianist ad libs and which do not exist in the score. For starters, there’s the little hit on the downbeat of measure 131 and its antecedent sixteenth notes. In a similar fashion the Makoto Ozone adds a downbeat hit with an octave grace note at measure 133. After the key change, the soloist does nothing extraordinary for a few measures. Then in measure 144, as the main melody line has the ascending staccato eighth notes, the pianist enters with complete abandon, adding jazzy and bluesy sixteenth note runs in several octaves. As you can see none of this is indicated in the score. On the other hand, one might ask: Does it enhance the performance? Would it be untoward for a soloist in a Mozart piano concerto to add to its performance? What about a Bach concerto or one by Liszt? It’s well known that many composers embellished their works even after they were published. It’s also well known that Gershwin was a talented improviser and that Rhapsody in Blue was scored, rescored, and modified in any number of ways over the more than 90 years since its premiere. In fact, Gershwin was known for sitting down at a piano at social events and, asked to play some of his music, improvisations on his tunes were frequently heard. Would the composer have played these kinds of figures in a concert performance? The soloist in this recording obviously felt that his additions complemented the work. To a purist in the audience, this might not have been the case. To others, the exuberance and excitement of hearing “a new version” might have made the concert electrifying. In this next example you’ll hear bits and pieces of the highlights from many of those heard above. The recording quality in Example 58.8 is such that there are features more readily heard than some of those to which we’ve listened. This is a recording by the St. Louis Symphony Orchestra conducted by Leonard Slatkin with the solo performed by Jeffrey Siegel. The three wind soloists take their rubato at face value and slowly present the bluesy two bar phrases. The string pizzicato on the downbeat of measure 131 is clean and has the included triangle hit. There is no cymbal hit on the fourth beat of measure 136. The saxophones are quite noticeable and the timbre differences between the alto and tenor are evident, but still work together nicely. Siegel plays the piano part as written. And, the cymbal roll during the triplets emphasizes an unwritten crescendo throughout the measure. One additional item that is obvious in this recording is the emphasis on the string basses. Of all the recordings surveyed here this one has the most “bottom.” It’s not at all unpleasant, but creates a distinct weight to the section that works well as it contrasts with the previous airiness of the rubato wind solos. Best for last? Not necessarily. There are quite a few keepers in this brief survey of some of the variations on a passage from Rhapsody in Blue. Yet, most of those performing were not alive during the Gershwin years. One exception is Mitch Miller. If you’re old enough, you may remember that he had one of the first interactive media programs (of a sort) on television: A sing along program in the early 1960s called “Sing Along With Mitch,” while a male chorus sang, the lyrics were placed over the lower portion of the screen so that watchers could sing along. In his youth, Miller was an oboist and when he came to New York City in the 1930s he worked under a variety of composers and conductors, among them was George Gershwin. Some fifty years later, Miller made recordings of several of Gershwin’s symphonic works. Example 58.9 is the same passage we’ve been reviewing, played by the London Symphony Orchestra with Mitch Miller conducting and David Golub on the piano. You can hear a distinct flavor for the solo winds that was not present in the previous examples. They are bluesy, yes, but almost border on lethargic. But as soon as the trombone finishes, Miller speeds up the descending woodwinds and the pace continues. Note that he does not give in to the unwritten enhancement of the cymbal crash at the end of the measure. When the saxophones enter at the key change Miller provides a much jazzier phrasing than previously heard. There are some invisible slurs that make the passage a bit more exciting and fluid than the others, and with a jazz infused feel. The cymbal roll behind the triplets in measure 140 is very understated and unlike the other recordings here, the quarter note chords on the final beats of each measure from the piano are not played staccato. Instead they are clearly held to emphasize the harmony, not just the beat 4 accents. The upper woodwind eighth note activity in this section is present and easy to discern, but they balance nicely with the rest of the orchestra. You may be wondering why I’ve omitted some of your favorite recordings of the Rhapsody. I would be wondering the same thing too. I had more than one that I wanted to hear in comparison to a variety of others, but during my investigation I found that all orchestrations of the Rhapsody are not created equal. The reason that several recordings are not in this survey is that they don’t exist in this version. Well, this passage does not exist in them might be an more accurate way of stating it. Many recordings of this work make a cut after measure 136 to a solo piano section beginning around measure 169 or sometimes to a more dramatic entrance of the solo piano at measure 175. Because my goal is to point out the variations in this entire passage, it seemed self-defeating to include those recordings that eliminate most of passage. Some of the recordings that make skips in the score here include those by Leonard Bernstein and André Previn. Be forewarned though, even those recordings that skip material at this measure are not consistent in the location to which they cut. Example 58.10 is one version of this cut. In this version, note how Maestro Bernstein, rather than include a cymbal crash on beat four of measure 136, essentially makes the piano entrance on the low octave Ds the fourth beat of that measure. In fact, in one of the earliest recordings of Rhapsody in Blue a similar cut is made. Whether the cuts were necessitated by the maximum length of recording media or some other reason is unknown. Artists creating new versions of existing material have been around for a long time. Parody masses come immediately to mind as do the many variations on La Folia from Scarlatti, Corelli, Geminiani and Vivaldi, among others. In the last fifty or sixty years, recordings have been made of many unfinished works in the classical canon and even completed works that someone thought could be improved. Mahler’s unfinished Symphony Number 10, of a variety of arrangements of Bach’s Goldberg Variations, and Mozart’s Requiem Mass with new orchestrations and minutes of additional material are a few examples. Given the rich history of “enhancing” preexisting works, why should Gershwin’s Rhapsody in Blue be exempt from such tinkering? No one knows what the composer had in mind. In addition, his ideas may have changed over time. With the Rhapsody there seem to be an almost endless variety of ways to approach even the 20 or so measures reviewed here. No one can say “This is the best” or even “This is the way the composer would have played it.” It’s a good idea to keep an open mind when listening to music. This is the first time I’ve done a review of different recordings of the same passage and I hope it was enlightening. As I stated, it began when I was reviewing the aspect of shifting rhythms by juxtaposing different forces. I will be discussing this in depth in my next series of posts. Please let me know if you have any questions, want to comment on or discuss the material.